Just a little show-and-tell today….. something I made for my favorite Eagle Scout, a memory quilt wall hanging or banner. 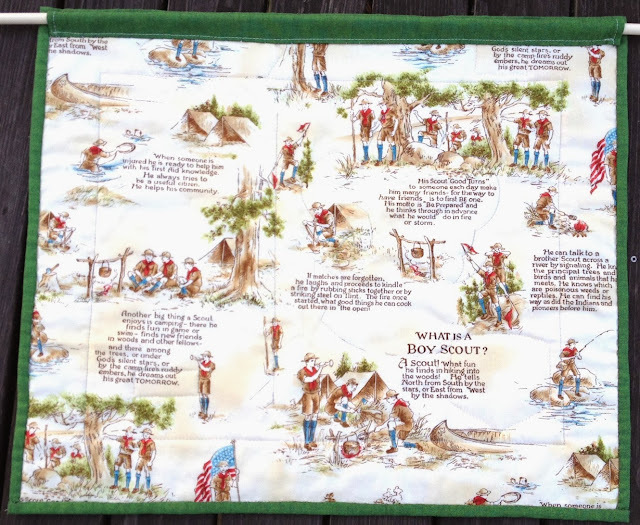 The center fabric panel is a reprint of a Norman Rockwell painting that I just love. To the right of it I stitched a tan panel to display his rank patches as he advanced. Included is the Arrow of Light patch at the bottom that carried over from Webelos. The badges around the edges of the quilt are the badges that he earned while a Scout. I left a little space on the upper left to add three additional badges that he's earned but not received quite yet. Also represented are his Conservation Award (the panda patch), the 100 year anniversary patch and a patch he got while hiking and camping at Philmont Scout Ranch this past summer. Accented with red and a scouty green, the quilt is backed with another Boy Scout themed fabric shown below. To finish the memory quilt wall hanging I stitched a tube to the back so that a dowel could be inserted and it could be hung on the wall. 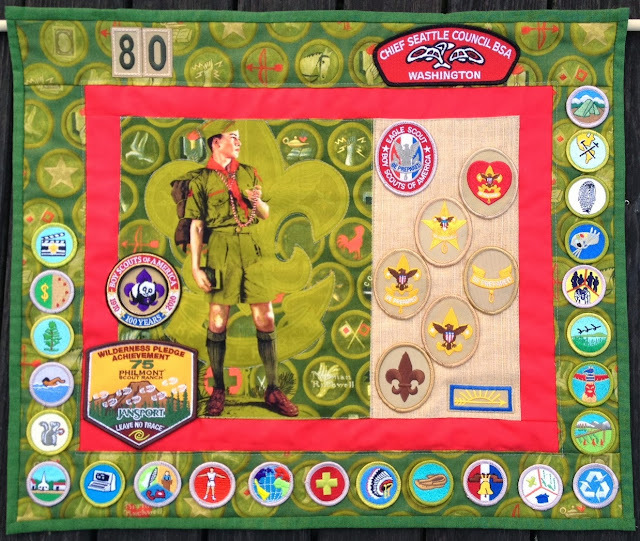 This Boy Scout memory wall quilt or banner was finished just in time for his Eagle Scout ceremony -- so proud of him! Awesome Vintage Embroidery Pattern Site!